Agate is a Norwegian quartet which was founded back in 2004 in Oslo, through the years they had to face several line-up changes, but since 2008 they have a stable line-up. They self-released the EP Noble Truth in 2007, the songs were based on Buddistic philosophy. 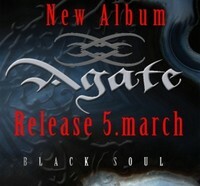 Now the have a new promo EP which is called Black Soul. The EP kicks off with Gone, slowly and atmospheric they start, pick up speed and add some heavy riffs. The Norwegian mix different sounds / elements to create some heavy, but melodic sound. Mira Birkelid's vocals give the song a catchy edge.... Later there are reminiscences to 70's heavy rock, and then they head into a pop rock part. The song is over 7 minutes long and so gives them enough space to surprise the listener with twists and turns. You can label them as progressive rock / metal, if you need to categorize them... A classic piece shines through at Losing My Faith where bassist Ron Torgersen joins Mira on the mic. Actually the voices were well together and the song gets something special due to the shared vocal duties. The dark, heavy rocker is enchanting. Partly riff-based, partly piano-based, but with tempi changes and different atmospheres they can keep the listeners interest all through this almost 8 minute long tune. Luckily they keep the concept of shared vocals duties for Angel Of Mercy, a symphonic metal track. A quite heavy track which also cites some classic piece. The band named Clannad among their influences and here I can hear it for the first time. At Time they offer fast, heavy parts and slow, keyboard-based passages. And again you find references to classic music and a dash of Irish folk - the Clannad influence. The closer is the title track Black Soul, another guitar-driven tune. But again Agate take you onto a sonic roller coaster ride. At the title track Mira's phrasing partly reminds me of Cristina Scabbia... The foursome offer another epic piece with twists and turns. I guess, I would have used this one as an opener, coz it really hooks you up. Somehow it seems that Agate haven't found their own style yet, but they are on their way. I like the combination of Ron's and Mira's voices, even if I think that it would help Ron to take some vocal lessons.... The sound is okay as this is a promo EP, if it would be an official release by a label, I would argue the quality. Interesting band, I'll keep an eye on them!